MIMO-OFDM is a key technology for next-generation cellular communications (3GPP-LTE, Mobile WiMAX, IMT-Advanced) as well as wireless LAN (IEEE 802.11a, IEEE 802.11n), wireless PAN (MB-OFDM), and broadcasting (DAB, DVB, DMB). In MIMO-OFDM Wireless Communications with MATLAB®, the authors provide a comprehensive introduction to the theory and practice of wireless channel modeling, OFDM, and MIMO, using MATLAB® programs to simulate the various techniques on MIMO-OFDM systems. 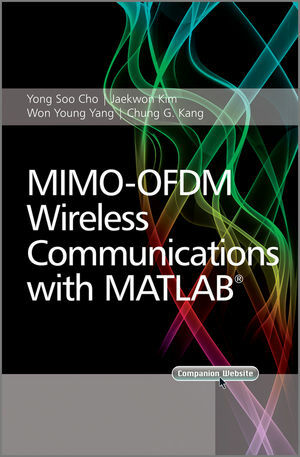 MIMO-OFDM Wireless Communications with MATLAB® is a key text for graduate students in wireless communications. Professionals and technicians in wireless communication fields, graduate students in signal processing, as well as senior undergraduates majoring in wireless communications will find this book a practical introduction to the MIMO-OFDM techniques. Yong Soo Cho is a Professor of Electronic Engineering at Chung-Ang University in Seoul, Korea. He has taught OFDM for 10 years and MIMO for 5. His research interests are in the areas of digital communication, digital signal processing, and FPGA Implementation. Cho has held positions at LG Electronics, the ETRI Mobile Communication Group, the WiBro Project Group, and was Chairman of the Wireless Access Working Group in Korea. He holds a BS from Chung-Ang University, an MS from Yonsei University, and a PhD from the University of Texas at Austin, all in electronic engineering. Jaekwon Kim is an Assistant Professor of Computer and Telecommunications Engineering at Yonsei University. Prior to that he worked at Samsung Advanced Institute of Technology with the 4G System Team. He holds a BS and MS from Chung-Ang University and a PhD from the University of Texas at Austin, all in electronic engineering. Won Y. Yang is a Professor of Electronic Engineering at Chung-Ang University. He has written two books on MATLAB in English, and two in Korean. Yang holds a BS and MS in Electrical Engineering from Seoul National University, an MS in Applied Math and a PhD in Electrical Engineering from the University of Southern California. Chung Gu Kang is a Professor of Radio Communication and Engineering at Korea University. Previous work experience inlcudes time in the US spent at the Aerospace Corporation and Rockwell International, where he worked on telecommunications systems development. He was also a Visiting Associate Professor at the UC San Diego. His research interests are focesed on the cross layer design issues for MIMO/multiple access schemes for mobile broadband wireless access systems and MAC/routing protocols for mobile ad hoc networks. Kang holds a BS from UC San Diego and an MS and PhD in Electrical Engineering and Computer Engineering from UC Irvine. Limits of Liability and Disclaimer of Warranty of Software. 1 The Wireless Channel: Propagation and Fading. 1.1.1 General Path Loss Model. 1.2.1 Parameters for Small-Scale Fading. 1.2.2 Time-Dispersive vs. Frequency-Dispersive Fading. 1.2.3 Statistical Characterization and Generation of Fading Channel. 2.1.1 General Indoor Channel Models. 2.1.2 IEEE 802.11 Channel Model. 2.1.3 Saleh-Valenzuela (S-V) Channel Model. 2.2.4 Frequency-Selective Fading Channel Model. 3.2 I-METRA MIMO Channel Model. 3.2.1 Statistical Model of Correlated MIMO Fading Channel. 3.2.2 Generation of Correlated MIMO Channel Coefficients. 3.2.3 I-METRA MIMO Channel Model. 3.2.4 3GPP MIMO Channel Model. 3.3 SCM MIMO Channel Model. 3.3.1 SCM Link-Level Channel Parameters. 3.3.2 SCM Link-Level Channel Modeling. 3.3.3 Spatial Correlation of Ray-Based Channel Model. 4.1 Single-Carrier vs. Multi-Carrier Transmission. 4.1.3 Single-Carrier vs. Multi-Carrier Transmission. 4.2 Basic Principle of OFDM. 4.2.1 OFDM Modulation and Demodulation. 4.2.4 BER of OFDM Scheme. 4.2.5 Water-Filling Algorithm for Frequency-Domain Link Adaptation. 4.4 OFDMA: Multiple Access Extensions of OFDM. 4.4.1 Resource Allocation – Subchannel Allocation Types. 4.4.2 Resource Allocation – Subchannelization. 5.2.1 Effect of Integer Carrier Frequency Offset (IFO). 5.2.2 Effect of Fractional Carrier Frequency Offset (FFO). 5.3 Estimation Techniques for STO. 5.3.1 Time-Domain Estimation Techniques for STO. 5.3.2 Frequency-Domain Estimation Techniques for STO. 5.4 Estimation Techniques for CFO. 5.4.1 Time-Domain Estimation Techniques for CFO. 5.4.2 Frequency-Domain Estimation Techniques for CFO. 5.5 Effect of Sampling Clock Offset. 5.5.1 Effect of Phase Offset in Sampling Clocks. 5.5.2 Effect of Frequency Offset in Sampling Clocks. 5.6 Compensation for Sampling Clock Offset. 5.7 Synchronization in Cellular Systems. 6.2 Training Symbol-Based Channel Estimation. 6.5 Advanced Channel Estimation Techniques. 6.5.1 Channel Estimation Using a Superimposed Signal. 6.5.2 Channel Estimation in Fast Time-Varying Channels. 6.5.3 EM Algorithm-Based Channel Estimation. 7.1.2 Distribution of OFDM Signal. 8 Inter-Cell Interference Mitigation Techniques. 8.1 Inter-Cell Interference Coordination Technique. 8.1.3 Flexible Fractional Frequency Reuse. 8.2 Inter-Cell Interference Randomization Technique. 8.3 Inter-Cell Interference Cancellation Technique. 8.3.1 Interference Rejection Combining Technique. 9.2 Deterministic MIMO Channel Capacity. 9.2.1 Channel Capacity when CSI is Known to the Transmitter Side. 9.2.2 Channel Capacity when CSI is Not Available at the Transmitter Side. 9.2.3 Channel Capacity of SIMO and MISO Channels. 9.3 Channel Capacity of Random MIMO Channels. 10 Antenna Diversity and Space-Time Coding Techniques. 10.2 Space-Time Coding (STC): Overview. 10.3 Space-Time Block Code (STBC). 10.3.2 Generalization of Space-Time Block Coding. 10.3.3 Decoding for Space-Time Block Codes. 11 Signal Detection for Spatially Multiplexed MIMO Systems. 11.6.2 Application of Lattice Reduction. 11.7 Soft Decision for MIMO Systems. 11.7.1 Log-Likelihood-Ratio (LLR) for SISO Systems. 11.7.2 LLR for Linear Detector-Based MIMO System. 11.7.3 LLR for MIMO System with a Candidate Vector Set. 11.7.4 LLR for MIMO System Using a Limited Candidate Vector Set. Appendix 11.A Derivation of Equation (11.23). 12 Exploiting Channel State Information at the Transmitter Side. 12.1 Channel Estimation on the Transmitter Side. 12.4.1 Optimum Antenna Selection Technique. 12.4.3 Antenna Selection for OSTBC. 13.1 Mathematical Model for Multi-User MIMO System. 13.2 Channel Capacity of Multi-User MIMO System. 13.3 Transmission Methods for Broadcast Channel. 13.3.3 Dirty Paper Coding (DPC). MIMO-OFDM Wireless Communications with MATLAB® Visit the website to access Instructor materials and MATLAB® code examples.